Every fall in northern Michigan brings a spate of dogman sightings. A radio DJ's invention, the dogman was created as an attention-getting joke. But millions of Michiganders believe in angels and vampires, werewolves, Bigfoot . . . and the dogman. Late summer, the mutilated bodies of two Native American girls are found in a tent in a remote campground in the Huron Mountains. Grady Service, who wants nothing more than to return to patrolling his beloved Mosquito Wilderness, is called into the case. Strange animal tracks are found, mayhem ensues, a bloody trail of victims begins to accumulate, and the governor, in a political panic and on her way out of office, orders Grady to hunt down and eliminate the killer--be it man or beast. From the author called "a master of his form" comes the ninth Grady Service Mystery, a chilling and action packed novel in which Joseph Heywood's legendary wilderness detective must use all of his investigative knowledge, woodcraft, and tracking sills to sort fantasy from reality. 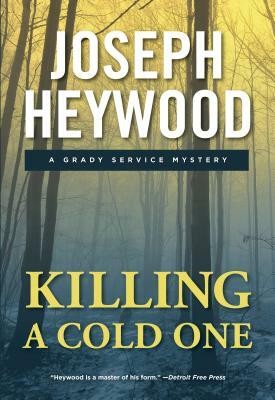 Joseph Heywood is the author of The Snowfly and Covered Waters (both Lyons Press), The Berkut, Taxi Dancer, The Domino Conspiracy, the nine Grady Service Mysteries, Hard Ground: Woods Cop Stories, and the two Lute Bapcat Mysteries--Red Jacket and Mountains of the Misbegotten. Featuring Grady Service, a detective in the Upper Peninsula for Michigan's Department of Natural Resources, the Grady Service Mysteries have earned its author cult status among lovers of the outdoors, law enforcement officials, and mystery devotees. Heywood lives in Portage, Michigan. Visit the author's web site at www.josephheywood.com.